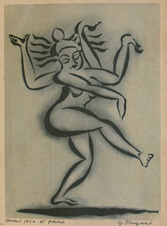 " The Dancing Siva "
style painting at Hakubakai Institute and then at Tokyo Art College.
" The Imperial Palace in Rain "
Born in Oyama City, Tochigi Prefecture and was named Tatsuo. Graduated from Tokyo Art College majoring Japanese style painting. 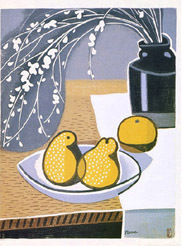 He taught at schools and also active in painting and making prints. 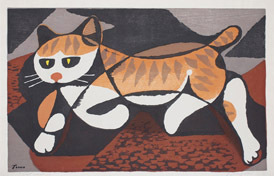 Japan Sosaku-hanga Association, Shunyo-kai and Japan Hanga Association.
" 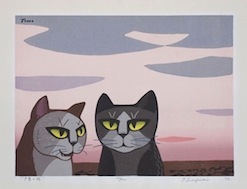 Cats at Sunset "
the front cover, which helped to bring him international fame.
" 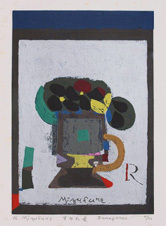 Pansies in a Pot "
study group together with Muto Rokuro and Yoshiwara Masamichi. 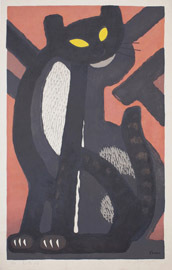 1932 He joined to establish <Shin Hanga Syudan(The New Print Group)>. This group was restarted as <Zoukei Hanga Kyokai> in 1938. 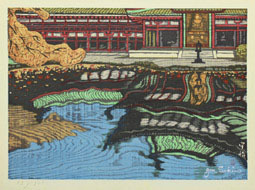 1959 and became member of Japan Print Association. exceed oil paintings in their vivid expression. 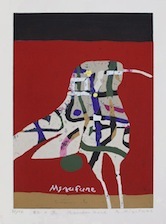 The artist says; Any print or sculpture first comes to me as a form of poetry. his Seiryusha Group in 1937. 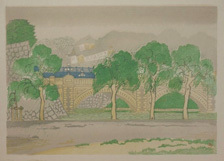 He lived and worked in Kyoto until his death in 1977. 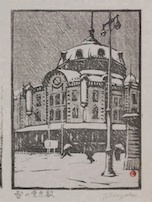 1924 .Graduated from Kyouto City Art College. 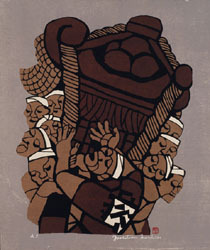 1928 Published the print magazine "Han(Print)" with Munakata and other artists. Asano Tkeji and Kamei Toubei. 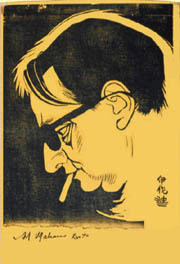 1930 .Published the print magazine "Kitsutsuki " with Onchi Koushiro and others. 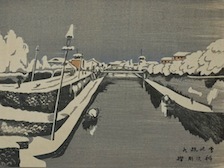 Published the series of 12 wood block prints titled "New Views of Kyoto"
1977 .Published "Brief Sketches of Paris", a series of essays. under Yanagi Muneyoshi and Serizawa Keisuke.
" 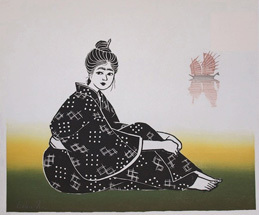 A Girl in Ryukyu (Okinawa)"
1928　transferring from Nihonga (Japanese Style Painting) to hanga. 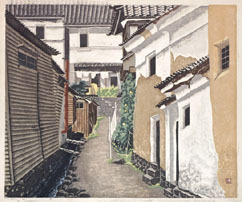 1931　-izing hanga in Kyoto. 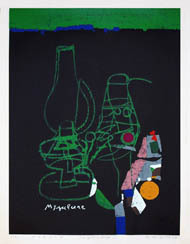 1972　debut as a potter. 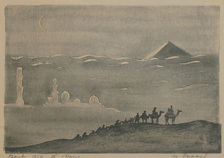 "The Town of the Forlorn Castle"
his print works were soon accepted by Toko-kai, Nitten and other public Exhibitions. he found innate both in rural areas and towns.